Not everyone got it yet. Only brand new members got one so far. Don't fear; all members should be getting one soon! 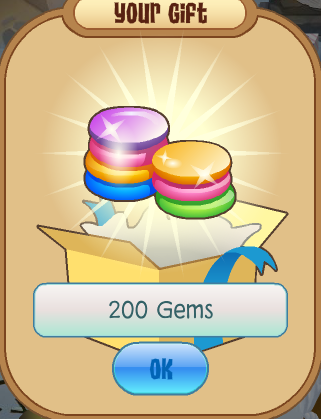 Apparently the next daily gift (or possibly monthly gift) has been revealed. 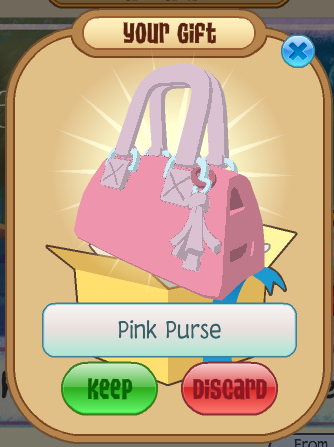 Some jammers already have this item. 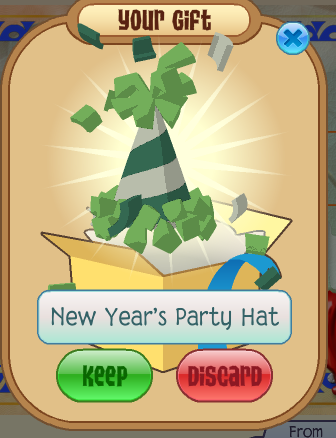 It looks like some type of party hat for new years. 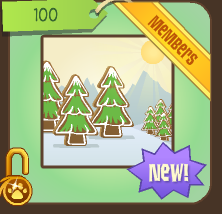 It shows that it is a member only item. 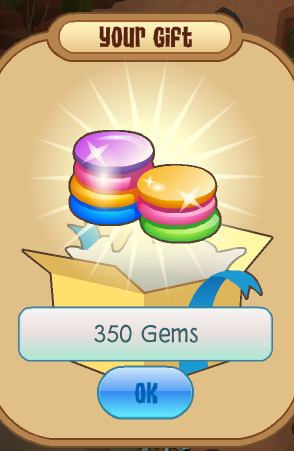 That gives it more chance of being the next monthly gift. The question is, where are people getting these hats? 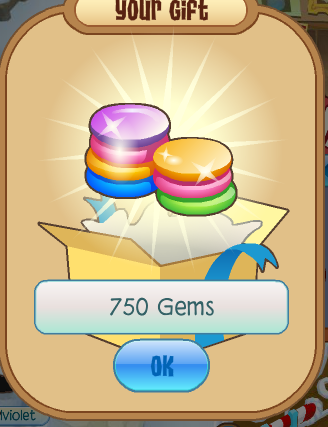 Gift 17 only comes in one color. 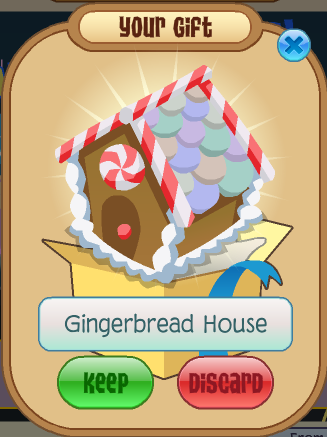 Gift 16 is a very cool land clothing item! Even better, it's for ALL players! I will be updating the pages, layout, and more of this blog. Gift 14 is something that didn't appear in the Jamaaliday Jam party. It's pretty small, but it's cute. The Jamaaliday Jam party will probably no longer be available to go to. 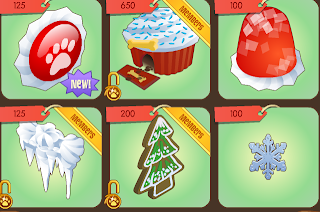 Also, reindeer will no longer be available pets, so you should get yours soon. And yes, there are rumors that I am quitting in February. Well, the rumors are true. Though I may change my mind, who knows? And please don't ask me for my rare items. 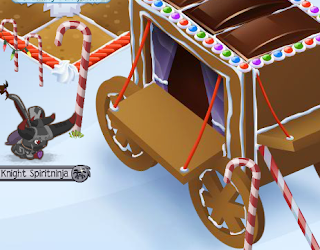 Horses should be coming soon (Thursday the 29th). It seems AJ HQ will be giving gifts until New Years. I can maybe get that candy fire I wanted! This will probably be the last gift. Happy Jamaalidays everyone! Of all the 11 gifts, what was you favorite? Mine is probably the mini gingerbread house. This isn't necessarily news, but more of a notice. 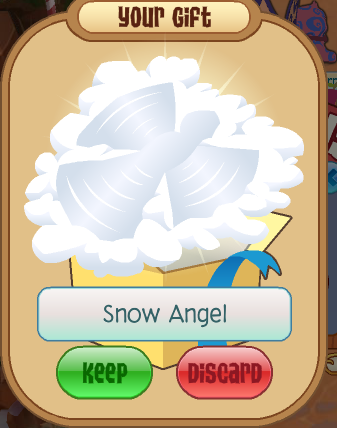 Since I got my Top Hat item, I've been begged a lot for it. I love to wear it (not because it is rare, but because I just like top hats). But I can't wear it without being asked or begged for it. Recently, people have been saying things like "trade me the top hat or I report you" and "gimme it it's the holidays". 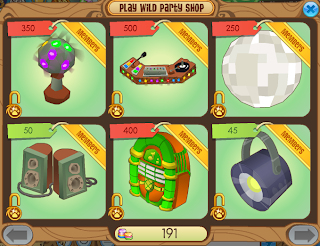 I work hard to get my "rare" items. And there are certain things I want to trade the top hat for. Here is a lost of things I want for my top hat. And that's pretty much it. There are some items that I still will accept that I didn't list. I know some Jammers will say "that's not a good trade" or "that's not worth it" and stuff like that. No one said you have to trade with me. If you don't like my offers, you can simply say "no". Sorry I had to post this. 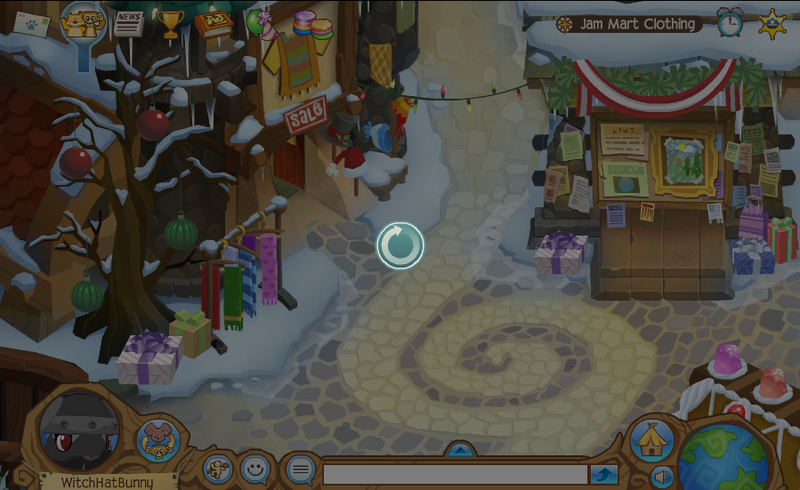 Beggars have just been making AJ less fun, especially when I got yelled at for not accepting a trade. I just had to clear some things up. What can I say, it's cute. 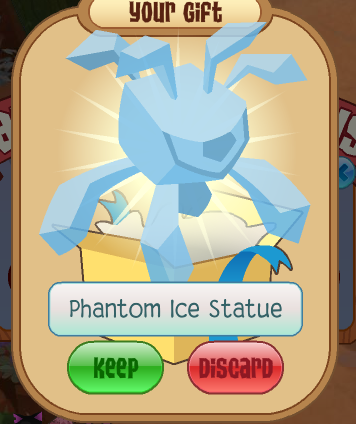 Phantoms have placed a lock on today's gift! AJ HQ is on the case! 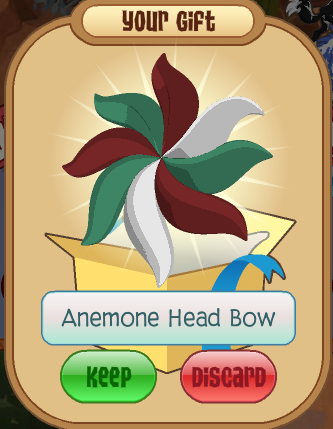 Now, the Anemone Head Bows are available for all players! Not too long ago, horseyhorse told me that she recently was sizzlerat. 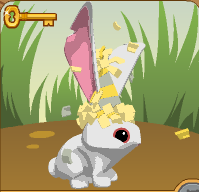 We though sizzlerat quit or something, but really, she is just staying hidden. Much like AJ Guides (GuideBunny, etc.) don't show up when you try to search for them, you can't search for sizzlerat either. There is one guide (GuideKit) who actually does show up when you search for them. My guess is that he is a fired guide. 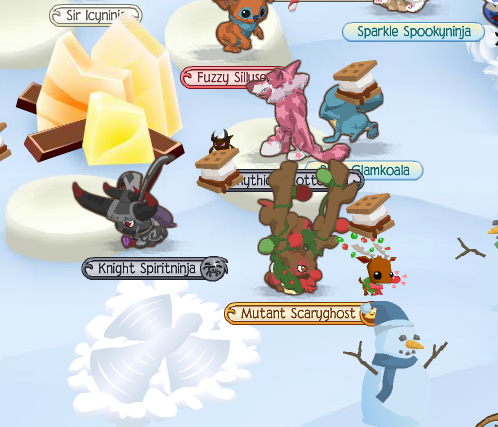 Anyway, horseyhorse saw sizzlerat with some weird new items, pets, and features. Unfortunately, we don't have pictures. sizzlerat said "testing testing". 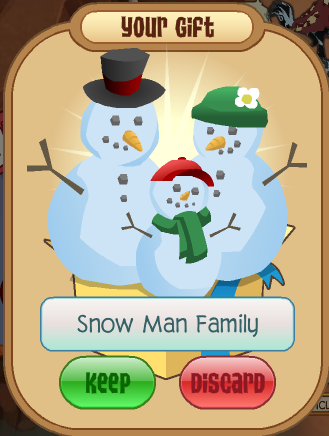 In the top right corner of the speech bubble, was a smaller version of the smile emoticon. The last time I saw sizzlerat (about a month ago), she was using the "joy" emote over and over again. 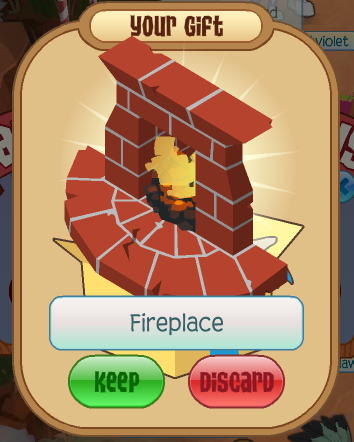 Gift 8 is something most of us have really wanted - the fireplace! 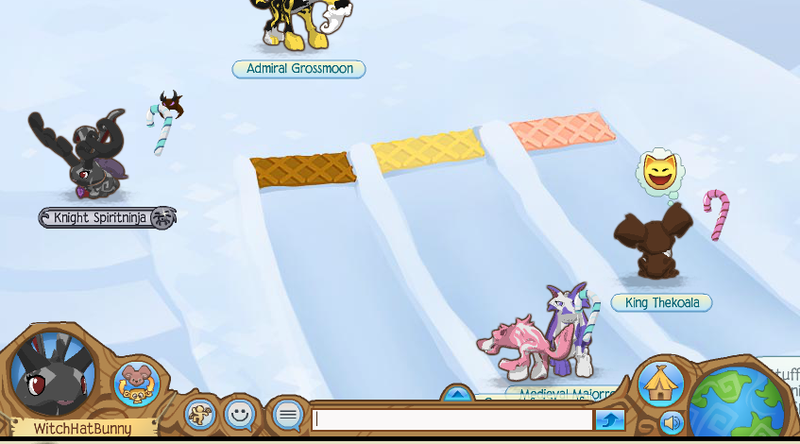 If you didn't notice already, AJF has started to snow. 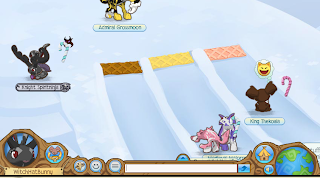 I understand that a lot of AJ bloggers want to get snow on their blog too. Well, here's how to make your blog snow. Make sure you are on your blog and singed in to your Google/Blogger account. First, click 'Design' in the top-right corner. 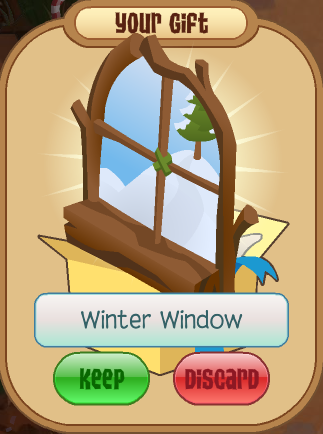 Now on the left side of the page, find this and click "Layout"
You can repeat this process as many times as you want to get even more snow. I did this 3 times. And I know everyone is probably bored of the phantom background. Please give me your ideas on what I should change it to. 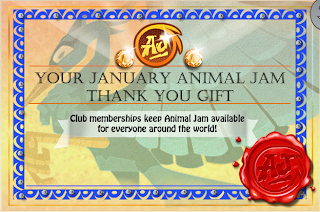 Again, the gift today is from the Jamaaliday Jam party. 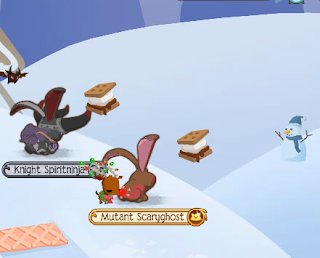 Maybe we will get a candy campfire soon? 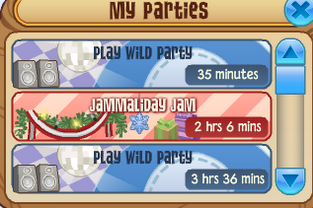 The gifts we've been getting (other than the 200 gems gift) were all items from the Jamaaliday Jam party. First, thanks to GreenFun for finding this. You can read GreenFun's post here. 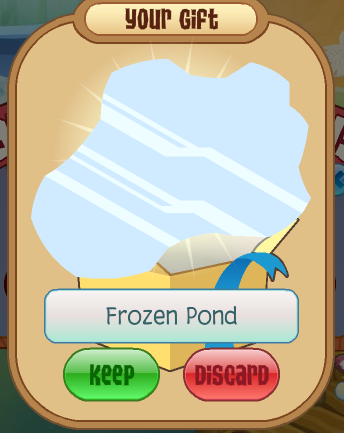 Now, when you try to play most multiplayer games (Fruit Slinger, Gem Breaker, River Race, etc.) 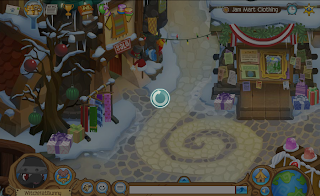 You will get this "message"
Now you can easily choose to play by yourself or with others. 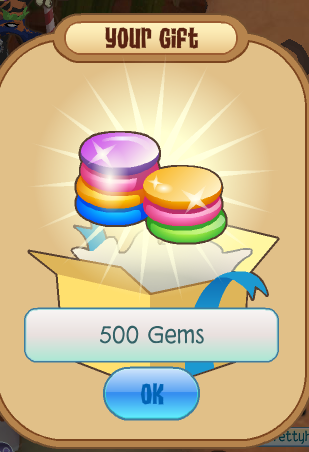 No matter what gift you choose, you will get the same prize as everyone else. Every day there is a different prize. 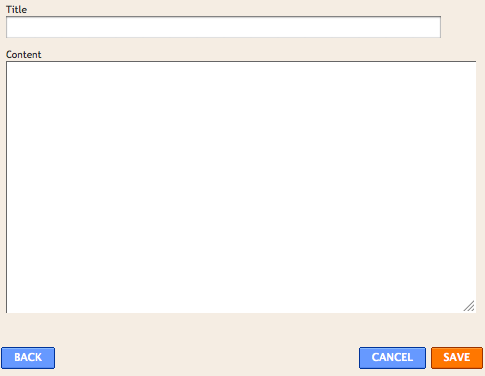 So I've edited the page and changed its name. So if you want to be my buddy, click here. Everyone in the room (even myself) disappear. Again, you have to refresh to fix this... Are these happening to you too, or is it just my low-quality computer? Unfortunately, if you miss a day, you can not get that day's gift. 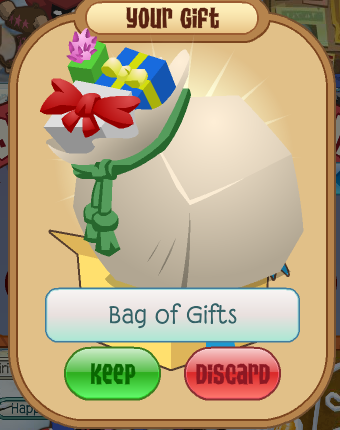 What do you think tomorrow's gift will be? 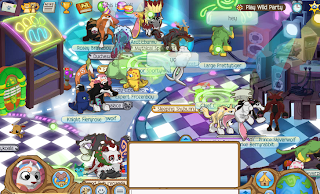 As I said in an earlier post, this post will tell you all about AJ's newest feature - parties. Click Go Now! to get into the party. There are two party rooms. The first one is a different version of Club Geoz. You can already buy these items in Jam Mart Furniture though. 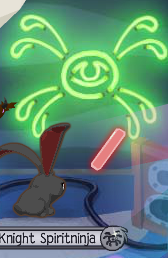 You can also click the neon phantom for a glow stick. 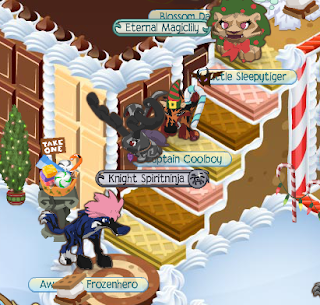 The other party room is an extended version of the gingerbread house den. In the back are some icy slides. 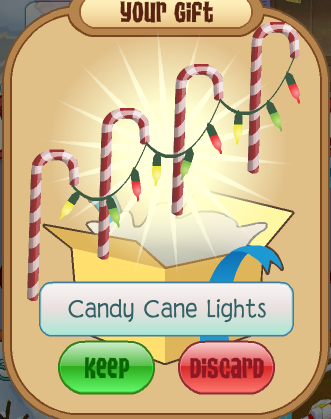 The candy cane you get changes every time. 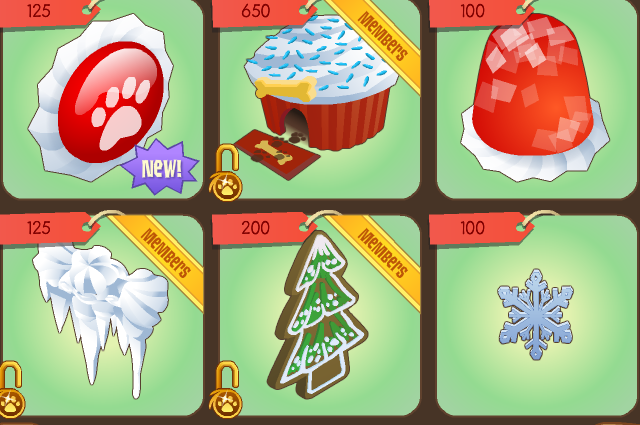 A new Paw Candy decoration for your walls! 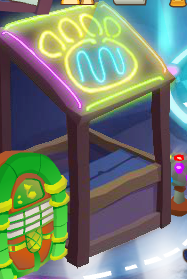 Which party room do you like better?